Volunteers at the 2011 clean-up. SAN FRANCISCO — In preparation for Memorial Day, the Japanese Cultural and Community Center of Northern California (JCCCNC) is organizing its fourth annual Colma Japanese Cemetery Clean-up Day on Saturday, May 18, from 10 a.m. to 2 p.m. 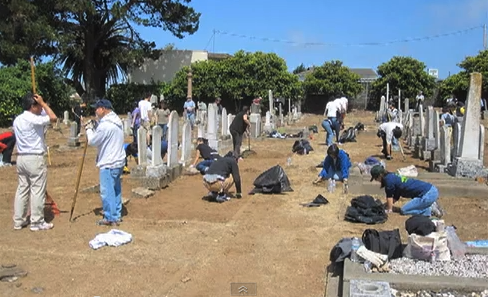 Since 2009, over 100 volunteers from around the Bay Area help each year to beautify much of the three-acre cemetery. However, the goal for this year is to clean the entire cemetery, which will only be possible with the help of at least 200 volunteers. The JCCCNC has received generous donations to help cover the additional costs associated with cleaning the entire cemetery, which include purchasing additional supplies and providing lunch for volunteers. Now all that is needed is the volunteers. The JCCCNC and all supporting organizations urge groups, teams, families, individuals, young and old, to come out and help honor the past, remember those who passed on, and learn about a place that deeply represents the history of the Japanese American community. Volunteers are needed to weed, rake, scrub, scrape, and place fresh flowers throughout the cemetery. They will be served water, snacks and a light lunch. Tools and other cleaning supplies will be available, but volunteers should bring their favorite tools and their own gloves. The clean-up is supported by: Boy Scout Troop 58, Konko Church of San Francisco; Buddhist Church of San Francisco; Hawaii Chamber of Commerce of Northern California; Hawaii Music Live; Japanese American Citizens League; Japanese Benevolent Society of California; Japan Society of Northern California; Japanese Chamber of Commerce of Northern California; Japanese Bilingual Bicultural Program, Rosa Parks Elementary School; Nihonmachi Little Friends; Japanese Community Youth Council; San Francisco Japanese American Religious Federation. The cemetery was established in 1901 by the Japanese Benevolent Society with support from the Meiji Emperor to provide “a suitable burial ground for deceased Japanese.” It is now a resting place for over 5,000 people. Monuments include a tower honoring three crewmen from the Kanrin-Maru, which arrived in San Francisco on March 17, 1860 and brought the first Japanese embassy to the U.S. to strengthen goodwill between the two countries.